Dell and Good Hook Up - Update | BlackBerry Blast! Last week, Dell and Good Technologies announced a partnership that they said would be officially announced today. The announcement came with a few more details about how the two companies will collaborate on wireless handhelds in a nonexclusive agreement. The goal of the partnership is to work toward providing handheld devices that are "as easy to deploy...as it is to deploy (a PC)," said Good CEO Danny Shader. According to CNET, the two companies are initially collaborating to sell Dell's PowerEdge servers with Good's messaging-server software, named GoodLink. "In the second half of this year, Dell will likely begin reselling Good's G100 handheld devices. Next year, the companies will begin selling a jointly developed Dell-branded handheld computer designed to take advantages of next-generation 2.5G cellular networks. The device will likely run Microsoft's Pocket PC operating system and will include GoodLink handheld software. No other details of the device were available." Good Technology has been making a serious effort to compete with Research In Motion who is the current wireless email leader. While RIM and Good have been embroiled in various legal battles, Good has been making progress with several agreements. 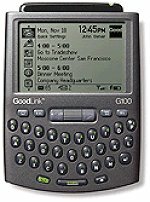 In October, Good announced it was teaming with Microsoft to make the GoodLink software work with Pocket PCs. The company made a similar announcement with PalmSource at about that same time.